Dan Standage is the national authority on Disability in the student veteran space. His experience as a Marine, Chapter leader, student veteran resource center director, and project coordinator for congressionally-directed research on veteran reintegration, provides a level of expertise that is both unique and valuable. 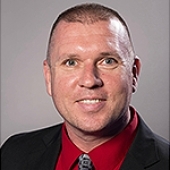 As Director of Disability in Education at Student Veterans of America, and Chair for the AHEAD-Veterans special interest group at Association on Higher Education and Disability, he is working to change the landscape of disability design in higher education. His strategic plan focuses on effective, veteran-inclusive communication, using servant leadership to change the veteran culture around disability, and connecting employment in a more meaningful way. In addition, he is collecting data and conducting primary-source research in this exclusive field and demographic. He holds a BS in Rehabilitation and a MA in Peripatology from The University of Arizona.